**I've Partnered with the Good Deeds Manger to talk about the importance of not letting your child become obsessed with Santa and Gifts during the holidays, but rather understand the importance of kindness, giving and sharing. All opinions are my own. Over the years, I have come across some of the most obnoxious santa and gift obsessed kids. Kids who tear through twenty Christmas gifts, then get upset when there are no more presents to open. Kids who have no idea why we celebrate the holidays. Kids who, when I walk through the door on Christmas day jump up and down asking, "What did you bring me?" I never want that to be my child. In an effort combat the creation of a spoiled Santa obsessed brat, I'm making it my mission to teach my kid the true meaning of the holidays. 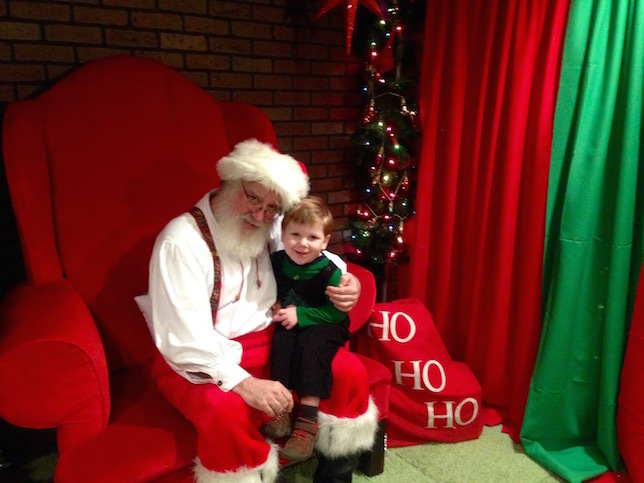 Below is a list of five ways I plan to stop my son from being a Santa obsessed kid, and understand that it's far more fulfilling to give than receive. 1. CHRISTMAS IS NOT ONLY ABOUT SANTA!!! First and foremost, I don't want my child to associate Christmas with Santa only. Being that my kid is three, I don't expect him to fully absorb the religious meaning behind Christmas, I do have every intention of making up my own mommy version so he understands Christmas is so much more than our family, Santa and presents. So. Much. More. 2. Keep the focus on giving, not getting. There's no doubt about it, giving is far more rewarding than receiving. I can tell my child already has a small grasp on that concept by the way he gets so excited when he helps me around the house, or the sweet smile he has after sharing his snack with me. During the holidays I have every intention of capitalizing his love to give by having him join me on donation drop offs and picking an angel of the Salvation Army Tree and helping me pick out a gift. 3. Family Centered. It's so easy to get whisked away with family events, holiday parties, shopping and everything else that puts us in fast forward during the holidays. But I think it's more important than ever to try to slow down. Try to enjoy the extra time off together and be thankful for our blessings. Start a tradition of family volunteering. Nothing, beats the feeling of helping others, especially those in need. family volunteer at a soup kitchen or for the Red Cross/Salvation Army. 4. Incorporate a daily reminder to focus on the important aspects of the holidays, being kind, loving, giving and well behaved! Being that I think the idea of moving an Elf around my house multiple times a day for a month strain is WAY too much, I'm giving the Good Deeds Manger a shot. This is such a cute idea. I also like that I don't have to lie to my child about a fake elf that's going to tell Santa if he's naughty or nice. 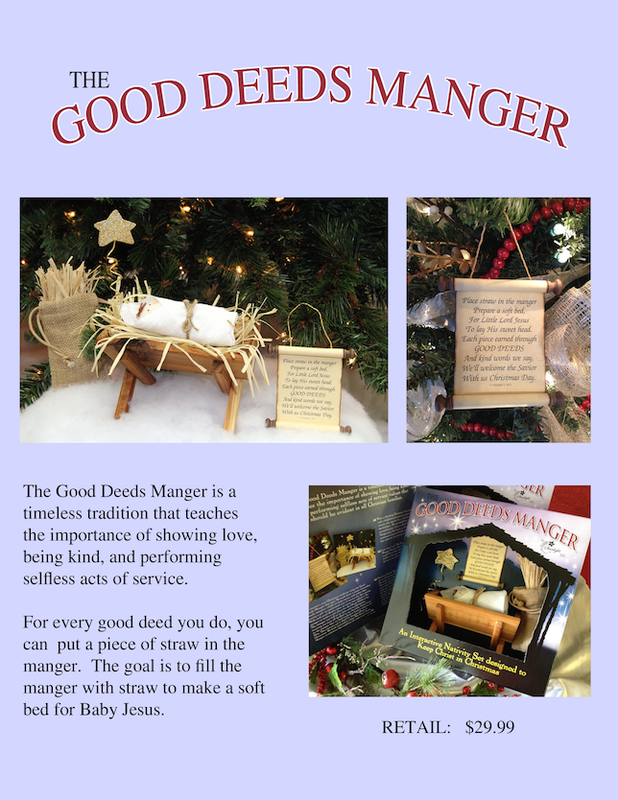 If you want a Good Deeds Manger too, Click here! 5. Keep Santa under control. Last year, FTD and I agreed that Santa would bring only ONE gift. The big one. Then we could give him two gifts each- Something he needs and something he wants. For example, last year my two gifts were Star Wars Pj's and a play-doh construction set. Being that he was two, five gifts on one day was MIND BLOWING. I expect still at three year old, five gifts will still be fantastic. I firmly believe there is absolutely no reason why my little guy needs a bunch of gifts on Christmas to make the holiday great. When he needs is a few fun gifts and a day of mommy and daddy swooning over him. How do you plan to teach your child that the holidays are not only about opening presents?